Sometimes being a complete ignoramus has its advantages. I grew up across the street from Reb Shlomo Carlebach zt’l shul in New York City, but I didn’t know who he was. When I first walked into his shul when I was fourteen years old, I didn’t see the concert performer most of the world knew, but rather a fiery orator, and master of both the revealed and hidden parts of the Torah. As I grew older and had the privilege of spending more time with Reb Shlomo, I got to experience something others have talked and written about. Namely, I got to carry his suitcases. They were large and literally filled with books. When he traveled, and he traveled around the world constantly, he wouldn’t go anywhere without bringing what amounted to a entire library of holy books with him. I once heard him say regarding the Torah, that “you have to need it to live”. He needed it to live. The thought of going to Israel, or Paris, or London, or Mexico, or Brazil, or Los Angeles — and not take the Ishbitzer Rebbe, or Rebbe Nachman, or Reb Leibele Eiger, or the Bais Yaakov, or all of the Rebbes with him wherever he went was unthinkable, or perhaps even more compellingly, impossible. “How can I not?” was a favorite expression of Reb Shlomo’s. 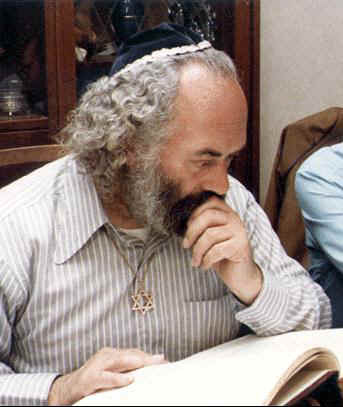 One of my saddest moments in life was a time when I really let my Rebbe down, and I caused him pain. I regret it a million times over. He asked me to bring him back a particular safer (holy book) from Israel. I’m pretty sure it was the Bais Yaakov, the son of the Mei HaShaloach. I was hurrying to catch a plane back to the states and I timed things poorly and I figured, okay, it’s not the end of the world, someone else will bring it. To this day, I am heartbroken at how upset it made him not to have it. He needed it to live. Reb Shlomo would often ask if you ever saw a college professor finish a class on Shakespeare and then kiss the book? No. But look at how much love, how many kisses we give the Torah. I remember being in the shul on 79th street on Simchas Torah. Ideally, everyone is dancing with the Torah. But how many Torah scrolls did the shul have? So Reb Shlomo stood on a chair surrounded by the chevra. On a chair next to him were stacks of holy books. Each one of us would dance holding one. But it wasn’t so simple. You think you can just dance with the neshamas of the holiest Tzadikim just like that? No. First, you had to promise our Rebbe how many pages you’d learn in the book, only then did you have the merit to dance with it. Reb Shlomo unlocked the depths of the Torah for us. He was the bridge, the holy messenger, that took the deepest, deepest, deepest teachings of the Rebbes that not only didn’t we know, but had no concept even existed, and somehow managed to communicate them in the clearest, most beautiful ways imaginable. To learn Torah with Reb Shlomo was Paradise itself. A friend once told me that he asked Reb Shlomo to tell him something that was just for him. Reb Shlomo told him “The world thinks that I want less from them, but the truth is that I really want more from them.” Reb Shlomo wanted the Torah and the depths of it’s teachings to be something that we swam in constantly. One Rosh Hashana he told the congregation, that from now on wherever we go, we should always make sure that we’re carrying a sefer — that we should never be anywhere without one. Anyone who wants to be a chasid of Reb Shlomo’s, or to try to understand his path, must understand the profound centrality of regular Torah study. The world was given a gift that it is only beginning to realize it has. That is Reb Shlomo’s own commentaries and explanations of the deepest Torah mysteries. What you can learn in one line from many of his teachings, you cannot learn, and I mean this very literally, in years and years of constant study. Such is the profundity and originality of his Torah understanding. Yeshivas Simchas Shlomo is the headquarters for learning Reb Shlomo’s teachings in the world today, in the heart of the world, Yerushalayem Ir HaKodesh. Everyone is invited to come, learn, live, develop wings, and fly.